State-of-the-art applications and features make using it a breeze. Significant cost savings on your energy bill! “Away Mode” saves energy when you're not home. Locking feature so children can't reset it. Takes it a few days to “learn” what you like. Movement by automatic vacuums will make it think you're home unless you reprogram it. A full-blown, professional version with all the bells and whistles. Has everything you need to control your Google Home. Very easy to install. Instructions come with several wiring options for different buildings. Sleek, futuristic look. Has problems keeping the time accurate, off by about 30-40 minutes. Sometimes misreads the room temperature. Intuitive design that makes it easy to use. Saves money on your energy bill. Can “lock in” the range of temperatures you want it to stay within. Includes an auto-away feature to save money on energy. Installation takes several hours. Requires a Nest account to use some of the features. The original Nest. It's beautiful and easy to use. Saves lots of money on your energy bill. Full wifi control from anywhere from your smart phone or tablet. Installation, set up and programming is easy. Good instructions. Only works in about 75% of homes. If yours isn't one of them you'll have to return it. Needs a C wire regardless of what the instructions say. Energy prices constantly fluctuate and we all need help staying abreast of them in order to save money. Nest thermostats that are programmable and learn from experience to can help you do just that. But which one is best? How do you decide between all the different options out there? We know you’re busy, so we’ve done all the hard work for you. 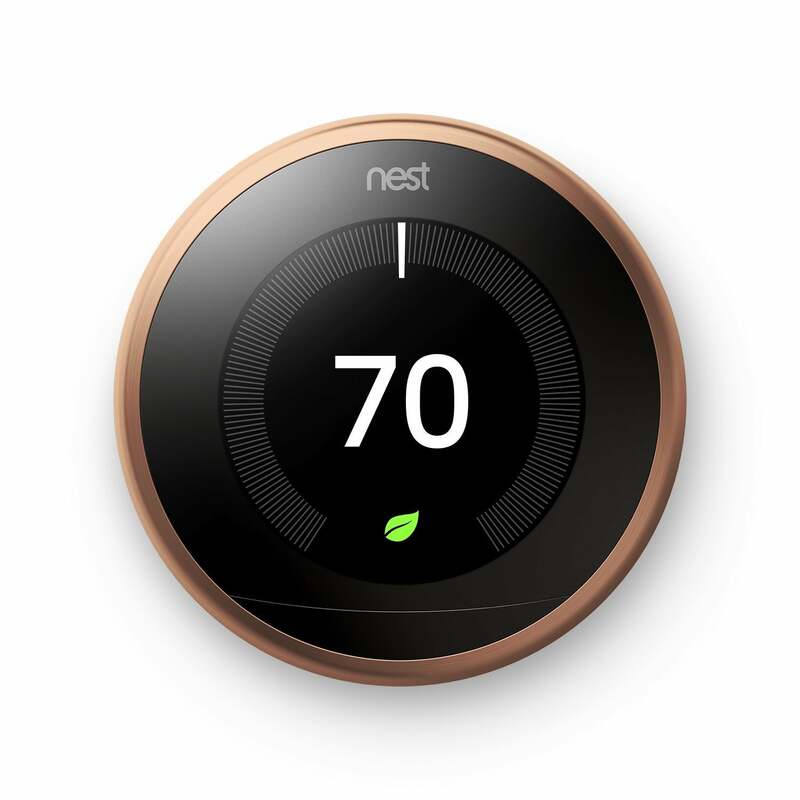 We’ve compared four different Nest learning thermostats, gone over all their features, compared them side-by-side and compiled it all into a simple, easy to use report that will answer all your questions. Armed with this information you can make the best decision about which thermostat to get for your home. Smart thermostats that talk to you through Alexa, your smartphone, tablet, or computer are a great way to save on your monthly energy bills. They monitor your activity through sensors to determine if anyone is in the house or not, and if not, they lower the setting so you’re not heating an empty house in the winter or cooling it in the summer. There’s nothing worse than coming home from a trip to discover you left the thermostat on the wrong setting. The “smarts” in them allows you to simply live your life without having to check the thermostat every time you come home or leave. Life is busy enough as it is, so this would be one less thing to worry about. The convenience and ease of use, not to mention the savings to your budget make these sleek, beautiful units well worth the price. A smart thermostat is essentially a thermostat with a computer chip and some memory added to it. The computer is programmed to regulate the heater and A/C in your home but also a plethora of other devices which can be connected to it through a wifi network. Lights, televisions, doors opening and closing, sunlight coming through the windows, and human activity can all generate heat in your house. 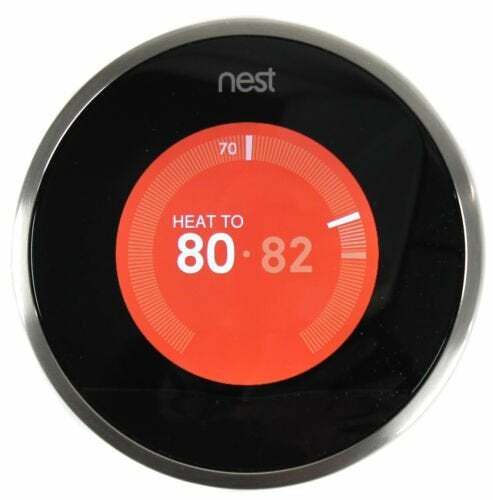 Smart thermostats have temperature sensors that can be purchased separately, usually in quantities of three, and sometimes a humidity sensor can be ordered as well. These can be stationed around the house to give the computer a better idea of temperature distribution in the building. They’re also equipped with motion tracking sensors to monitor how much movement is taking place in your house. They collate all this data and analyze it for patterns to determine when the temperature in the house is fluctuating the most, then turn the heater and A/C on or off as indicated. As time goes on, repeating patterns begin developing and the computer “learns” to anticipate these fluctuations and adjust accordingly. These preserve the ambient temperature in your house and lowers your monthly bills. Smart thermostats can also be programmed to know when you’re sleeping, at work, or gone on vacation. They can send you regular reports so you know if anything goes wrong. A sudden change in the temperature of the house might indicate a broken window from a storm or an intruder. This kind of real time information can be invaluable. The ability to control your thermostat from your smartphone or simply by telling it what to do through Alexa, brings a whole new meaning to simplicity and convenience. Wouldn’t it be great to be able to tell your house to warm itself up before you got out of bed? With smart thermostats – you can. In real estate, they always talk about location, location, location. The same thing is true with thermostats. If they’re too close to the door they’ll constantly register lower temperatures in the winter and hotter ones in the summer, then try to raise or lower the temperature according to that false reading. Examine the location of your existing thermostat. If it’s too close to a door, get the separate temperature sensors and install them around the house to counteract the inflow of outside air at your main unit. This will give you a more accurate reading and better control. Your smart thermostat can connect to a wifi-enabled dehumidifier to control it as well. Get the extra humidity sensor for the thermostat and install it. Once you’ve programmed the smart thermostat, it will automatically control the humidity levels in your house, turning the dehumidifier on and off as necessary instead of letting it run 24/7. Take a close look at the back of your existing thermostat before you buy a new one. There will be a plate on it showing much electricity it uses. If it’s labeled 110V, 120V, or 240V, you have a high voltage system and the Nest line of products won’t work with it. Connecting them to these kinds of high voltage wires will short them out. You’ll have to call a professional electrician to rewire the system so the Nest thermostat will work. There are five different kinds of thermostats, all of them currently still in production and available brand new on the market. We’ll cover each of them briefly. Touch screen technology took the world by storm when it was first introduced, and now it’s ubiquitous. Touch screen thermostats are not only easy to use, but they also included a quantum leap in features and built-in smarts. They had enough brains to include help screen, menus, and other advances that make paper manuals essentially obsolete. Everything is right there on the screen. Be careful though. Some touch screens weren’t designed with large fingers in mind. They can be quite unforgiving if your fingers are larger than normal and you’ll experience a lot of frustration trying to use them. There are some that are intended for larger hands, but make sure you check specifically for it before you buy. These wireless, wifi thermostats are the crème de la crème of the thermostat world. These have all the bells and whistles without the physical limitations of touch screen types. You’re already accustomed to the touch screen on your smartphone (which is adjustable) so you don’t have worry about usability if you’re one of those people blessed with large digits. These plug into an outlet in the wall and can control a portable heater or A/C unit. About the only adjustments on portable units are to turn them on or off, but these outlet thermostats can help you regulate temperature more evenly. These would be perfect for a work shed that has electricity but no heat or air. Some people don’t want to mess around “programming” a thermostat. They just want to press a button and have the heater or A/C come on. Manufacturers still make these, and they’re quite good. Despite not being programmable they have a sleek, modern design, and LED displays with large, easy to read numbers so you can see what temperature setting you’ve chosen and what the actual temperature is. They have up and down buttons for the settings and a switch to change from heating to cooling to off. These are available online and at most hardware stores and the prices are very reasonable. These make your life a lot easier than older models. They quickly became popular as soon as they hit the market. They come in a wide variety of designs and available features. Although they only control the heater and A/C unit, they can still save you a lot of money on your energy bill. Check the thermostat on a regular basis. Take the cover off and inspect the connections. Ensure that no dirt or dust is accumulating that could short out any of the wires. If there is any, blow it out with compressed air. Never use a dust cloth or feather duster. If you see any corrosion inside the unit, you’ve got too much humidity in your house and other electrical items may also be corroding. You should get a dehumidifier for the house and a humidity sensor for your thermostat. Change the filters in your air conditioner on a monthly basis. You should be doing this anyway, but with a smart thermostat, the need becomes more pressing. The thermostat is working on the assumption that heater and A/C is operating correctly. If it’s not, if the filter is dirty or clogged, the thermostat will give you bad results because it’s getting bad input. It’s the old GIGO law, the first law of computers; Garbage In, Garbage Out. Remember, smart thermostats have computers in them. Small ones, but computers nonetheless. Help them out by giving them accurate information on how your A/C is working and be sure to change the filter. Do I need to register my smart thermostat? No, but it registering it is the only way you can use the app on your phone, tablet, or computer. You can still use the base unit and access all the features, but doing so requires you to physically be at the base unit. That eliminates all the advantages of it being wireless. What is the difference between Nest generation 2 and Nest generation 3? Are smart thermostats difficult to install and maintain? Most people who ask this question are having flashbacks to the days of thick, awkward wiring and over-sized batteries that had to be replaced all the time. It’s understandable, most thermostats were like that for a long time, but today’s thermostats are far simpler to install and maintain. Most of them can be installed with a screwdriver and a little bit of time. Why invest in a smart thermostat? This is probably the most common question of all, and the question with the simplest answer too. Money. Smart thermostats keep a close watch on energy consumption and temperatures, 24/7, adjusting them as needed, even moment-by-moment, if necessary, to maintain an even, consistent temperature in the house. Maintaining an even temperature can save hundreds, even thousands of dollars a year on your energy bill. What's wrong with my manual thermostat? This is the second most common question, and it’s closely related to the previous one. The technical answer is, nothing is “wrong” with your manual thermostat. You’re simply not getting all the benefits that come from having a smart thermostat. 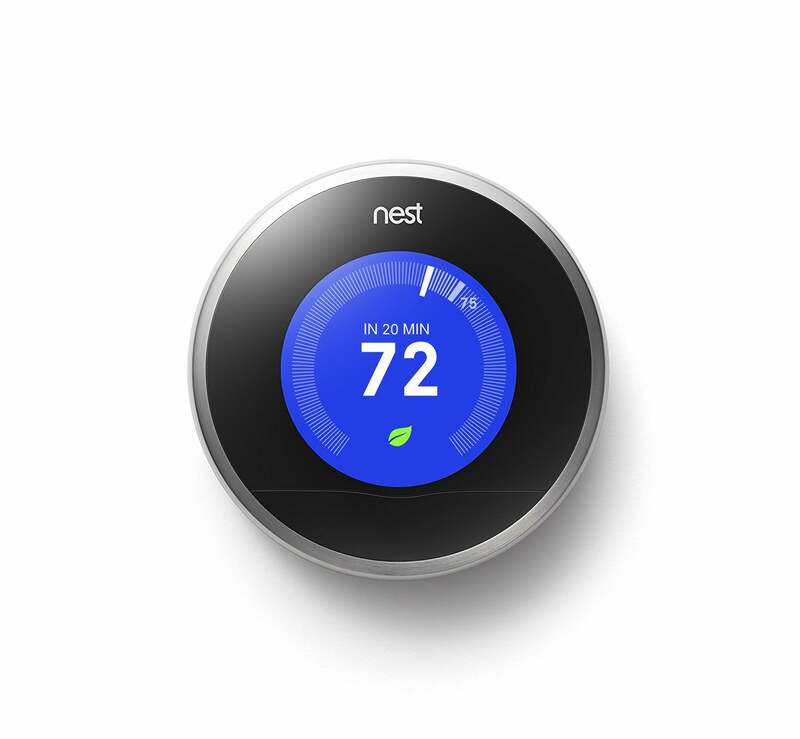 Convenience and ease of use is a major benefit of getting and using a smart thermostat. We've reviewed a full line of smart thermostats from different manufacturers, which can learn from experience the longer they're in your house. Knowledge is power and our team of researchers have tested them to help you make the best purchase for your home. Ecobee has a full line of smart thermostats which can learn from experience the longer they're in your house. Knowledge is power and our team of researchers have tested them to help you make the best purchase for your home.